Buzzard photo by Linda Bates. Linda Bates saw a group of large buzzards recently on Hasbrouck Avenue and took these photos of the birds. 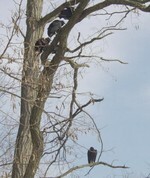 She writes: "(I saw) a group of buzzards in a tree and a house on Hasbrouck Avenue in Cornwall. They were actually all over the place, the rooftops and all. It looked like a scene from the movie "The Birds." I guess they are waiting around for something to die (dinner). Very large birds."